With exams just around the corner, Wilfrid Laurier University staff and students have been stepping up to promote the importance of mental health during this stressful time of year. This week, both the Wellness Education Centre and Laurier’s Natural Health Society hosted events aiming to provide students with resources to help keep their stress levels in check during exams. On Mar. 6 and Mar. 7, 2019, the Wellness Education Centre hosted an “Exams and Performance Anxiety” workshop as part of their “Ride the Wave” workshop series. Ride the Wave has been running every term since its establishment in September 2016. The workshops are free to all registered students and run weekly. “It’s all practical and skills based … we’re trying to put skills in the hands of students,” said Nathan Reeve, wellness education coordinator for the Wellness Education Centre. The exams and performance anxiety workshop has been the most requested workshop of this series and received the highest attendance of all the Ride the Wave workshops this year. It covered the importance of understanding and managing anxiety symptoms before and during exams, the self-perpetuating cycle of anxiety and the importance of self-care and preparation during stressful times. This workshop, like others in the series, was developed by counsellors based on the needs of Laurier students. Chris Kardol, a counsellor and performance coach at Laurier, was the person behind the creation and orchestration of the “Exams and Performance Anxiety” event. “They’re based on psychoeducational techniques … based on research and evidence,” Reeve said. Students were given a bag upon entrance to the event, which included a public speaker panel, an interactive sewing workshop and several different services provided by naturopathic doctors and wellness experts, and could choose from a variety of different products including succulents, soaps, candles, natural first-aid kits and more. This workshop catered to students across all faculties and years of study, providing an inclusive experience for all who attended. Reeve and Wheeler both emphasized the importance of providing resources to students that promote the maintenance of mental health through proactive and preventative measures. “We don’t wait until our teeth are rotten before we go see the dentist — and we shouldn’t do that with our mental health,” Wheeler said. On Apr. 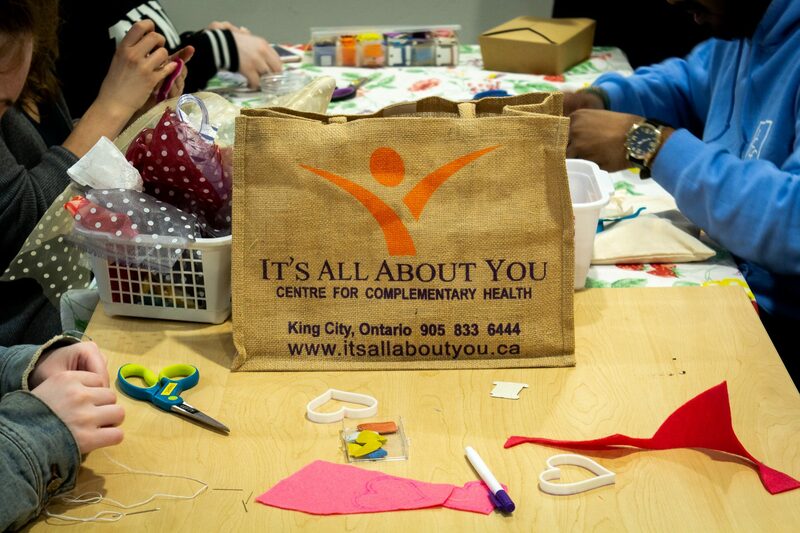 2, 2019, the Laurier Natural Health Society hosted a free “Self-Care Package” event in the Paul Martin Centre on campus. This was the second self-care package event the group had orchestrated. Since their first self-care package event, Laurier Natural Health Society switched their governance from the Wilfrid Laurier University Students’ Union to the Faculty of Science Students’ Association (FOSSA). This resulted in a significant budget increase for the event which gave the executive team more room to expand their vision and cater to a larger number of students. Aristaea Murrel, founder and co-president of the Laurier Natural Health Society, explained the purpose of the event was to help students take a break and de-stress while providing them with helpful products and connections to local vendors — all free of charge. “It starts with letting the students know they’re appreciated,” Aruna Rajpal, director of marketing and incoming co-president, said. “Everyone loves free stuff but having to choose what will benefit you most makes the experience more personalized and makes students consider their own individual needs,” Murrel said.